There are a few really busy days left before Christmas break. This weekend is full of wonderful music including my son’s first recital. He’s really mad at me for signing him up. Tough beans kiddo. Rehearsals and a performance for me with the orchestra at our church’s yearly community Nativity Celebration. The Messiah Sing-In is one of my favorite things to do at Christmastime. Info here if you are in the Raleigh area and would like to join in! 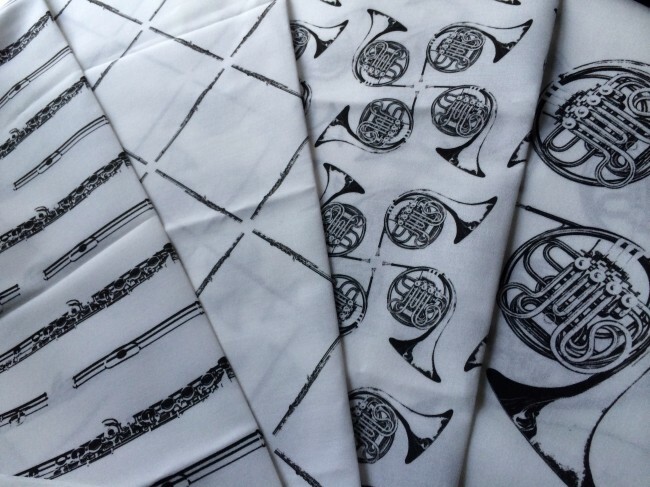 To stay with the music theme – my first batch of pretties arrived from Spoonflower today. 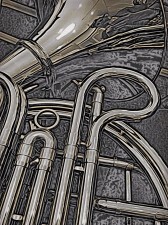 A little bit ago I spent a day playing around with photoshop and created several musical instrument designs. Then off they went to Spoonflower to be printed up. 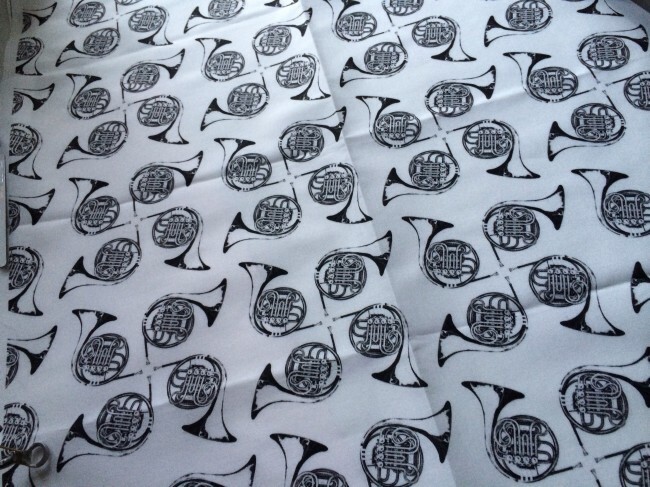 These are now available at my Spoonflower shop if you happen to be in need of fabric featuring french horns, flutes, or violins with wings. I know, not something everyone needs. Now I need to figure out what to do with some of these. They are fat quarters printed on a good quality quilting cotton. I’m thinking my next order might be a white on white print to play around with dying. 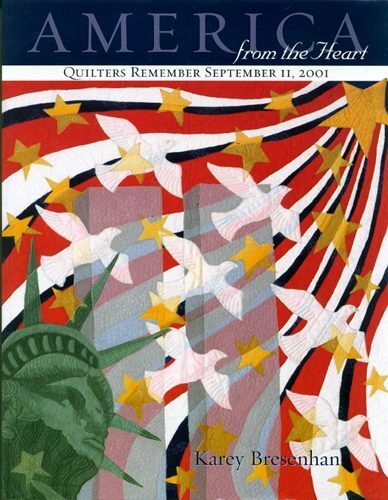 So for today’s giveaway – an extra copy I have of the book, America From the Heart: Quilters Remember September 11th, 2002. Post a comment and give me some ideas for what I can make with these wonderful fat quarters! I’ll pick a winner next friday. A black and white figure with a colorful world around them! Neat fabric! My suggestion is either wallhanging or tablerunner. Maybe using a contrast fabric, ie red and make music notes on a scale or floating around? i’m not real good with thinking out of the box, hehe. 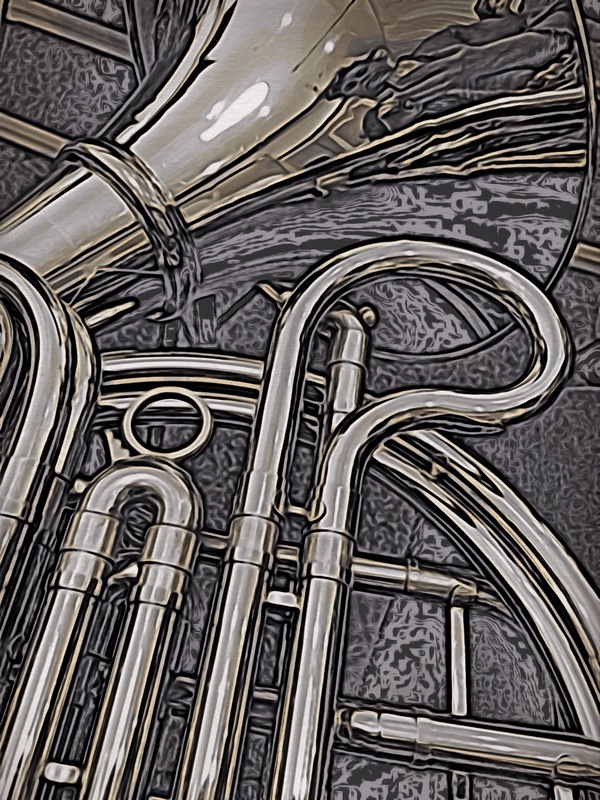 If you have a French horn teacher, you could make them napkins for a year end gift. I also like the idea of making something to carry your music in. My husband plays classical guitar and I think I will try that app and make something for him. 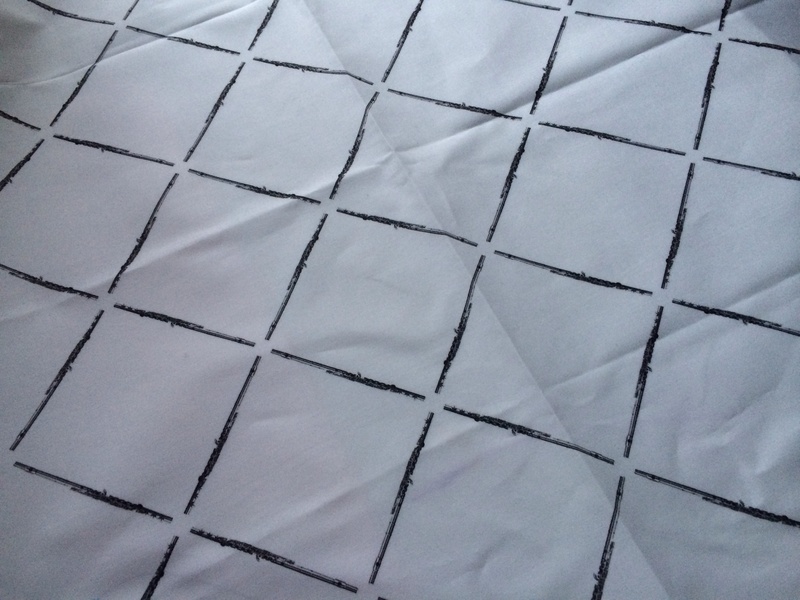 I love your Spoonflower fabric Lyric! How about making a bag for carrying your music??? Hi Lyric, I am really enjoying your blog. You have captured my artie heart! Hence I am exploring some different concepts at the moment. But I love your french horn fabric I am wondering how it would look if you cut them in the kaleidoscope fashion? A new design should come forth and allowing that you have sufficient fabric ie eight repeats it could be very interesting? By the way seeing it is the custom I wish you and your family a Merry Christmas and Happy New Year Julie Beard. BEAUTIFUL Lyric!!! I still think adding some color with some of your thermofax screens would be fabulous. 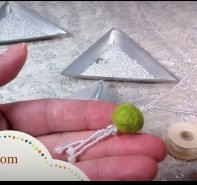 Then a wall hanging… with curved edges. 🙂 Did I mention the fabric is beautiful?